Everyone is abuzz today with news that Law & Order star Fred Thompson has jumped into the Republican presidential race. I'd rather talk about Rudy. David Boaz in the New York Daily News tells Libertarians to beware of him. Finally, someone in big media talks about his abysmal record as U.S. Attorney in New York. As a U.S. attorney in the 1980s, Giuliani conducted what University of Chicago Law Prof. Daniel Fischel called a "reign of terror" against Wall Street. He pioneered the use of the midday, televised "perp walk" for white-collar defendants who posed no threat to the community - precisely the sort of power play for which conservatives reviled former state Attorney General Eliot Spitzer. And Giuliani's use of federal racketeering statutes was so disturbing that the Justice Department changed its guidelines on the law. As a presidential hopeful, Giuliani's authoritarian streak is as strong as ever. He defends the Bush administration's domestic surveillance program. He endorses the President's power to arrest American citizens, declare them enemy combatants and hold them without access to a lawyer or a judge. He thinks the President has "the inherent authority to support the troops" even if Congress were to cut off war funding, a claim of presidential authority so sweeping that even Bush and his supporters have not tried to make it. He's also in many ways probably the least libertarian candidate in the race -- someone who pretty clearly doesn't believe in any kind of principled restrictions on the power of the state, and someone who's extremely eager to see the state deploy extreme violence as the preferred means of achieving policy goals. that he has thick ankles. Singularly fitting, I say. I swear I can just hear the strains of the 'Imperial March' in the background as his campaign theme. 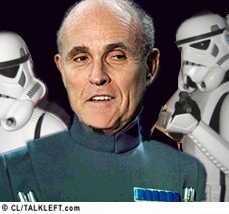 Pity George Lucas didn't fit an Imperial (fascist) salute to go along with the quasi-Prussian uniforms and jackboots; I'm sure Rudy would have missed the connotation, anyways...or wouldn't have cared.